Hydra is a soft-bodied freshwater polyp, that sometimes is accidentally introduced to freshwater aquariums. Hydra is composed of a tubular body with a sticky foot at one end and a dozen tentacles at the other. These tentacles possess stinging cells that allow the Hydra to immobilize their prey. Like jellyfish, Hydra has no brain, no respiratory system or even musculature, yet they pose a real danger to the freshwater aquarium. A small pest, measuring just an inch or less, they are capable of killing and eating fish fry and small adult fish. Furthermore, they reproduce rapidly by producing buds that grow into new Hydra that break off and go on their own. Although they generally put their foot down and stay in one spot, Hydra is quite capable of moving around. All they have to do is release their foot and float to a new spot, or slowly inch-worm along by attaching and releasing their tentacles and foot alternatively. Given their reproductive abilities, their capability for moving around when they choose to, and their ability to eat prey several times their size, it's clear why Hydra are not welcome in a freshwater aquarium. Once Hydras are introduced to an aquarium, they are difficult to irradiate, but not impossible. If you are fortunate to have a very small infestation, you may be able to physically remove the Hydra. Artificial plants and rocks can be removed from the tank and soaked in a 10 percent bleach solution for 10 to 15 minutes, then scrubbed and rinsed with plain water and allowed to air dry. A non-intrusive way to eliminate Hydra is to add fish that eat them. Three Spot (Blue) Gouramis are particularly voracious consumers of Hydra. Paradise fish and Mollies are also very fond of Hydra. Pond snails will also gobble up Hydra. If adding fish or snails isn't an option for you, heat can be used. However, you will have to remove your fish or they will be cooked. Once the fish have been relocated, turn the temperature of the water up to at least 104 F / 40 C for about two hours. Turn the heat back down, vacuum the gravel lightly and perform a large water change (approximately 50 percent). Make sure the temperature has dropped to the previous level before reintroducing the fish. Chemical or medicinal treatments are available that will eradicate Hydra, but keep in mind that some can be harmful to live plants, snails, and even the fish themselves. They can also impact the beneficial bacteria, so they should usually be considered the last resort. Among the chemical options are Copper Sulfate and Potassium Permanganate, which can be purchased at your local fish shop. Follow dosing instructions on the product. Many of the anti-fluke medications are also effective against Hydra, particularly those containing Formalin, such as ParaGuard. Contrary to what some might say, Hydra don't mysteriously appear due to poor tank care. Hydra must be introduced from an external source. Once there, having plenty of food sources will encourage growth. Therefore maintaining a clean tank and avoiding overfeeding will keep Hydras that do come into the tank from rapidly multiplying, which will give you time to deal with the problem. Carefully inspecting live plants before adding them to the tank, will help avoid accidentally bringing in Hydra. An even more proactive approach is to soak the plants for 5 to 10 minutes in a quart of water with a tablespoon of alum dissolved in it. The same can be done for rocks. Following soaking, rinse well with plain water. Live foods are great for conditioning fish for breeding, and to provide good nutritional balance. 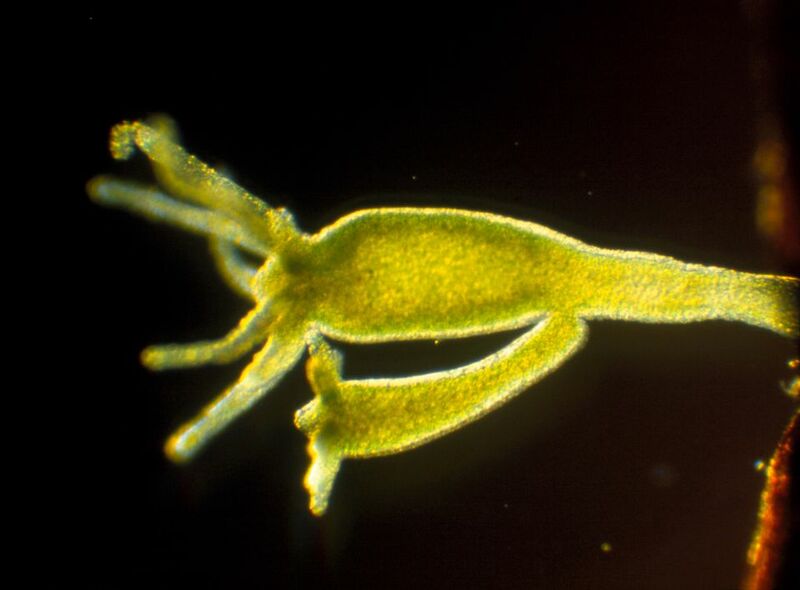 However, if the live foods are collected directly from freshwater ponds or streams, there is a considerable risk of collecting hydra at the same time. Using frozen foods, or growing your own live foods is less risky.